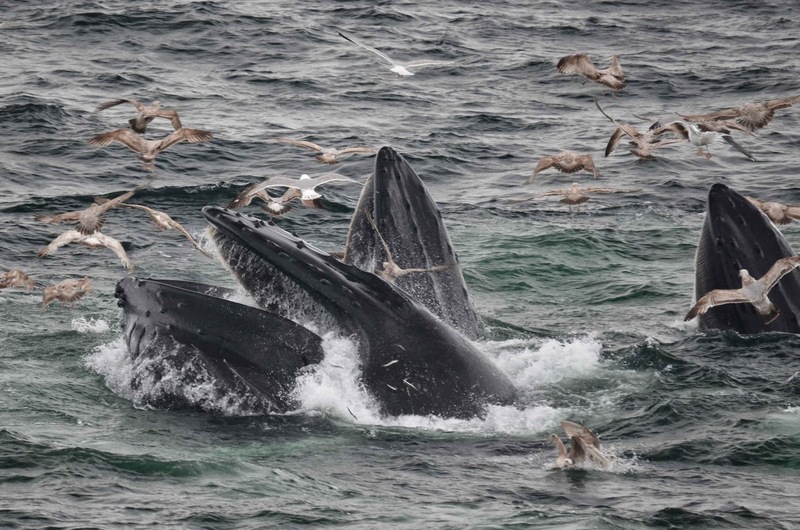 This afternoon, we headed out on the Asteria towards the southwest corner of Stellwagen Bank where dozens of whales have been enjoying a daily banquet of sand lance. As we approached the bank, our intern Sam and I scanned the horizon in search of activity. Tracking maybe eight to ten spouts along the horizon, we zeroed in on where the largest groups of feeding whales appeared to be. 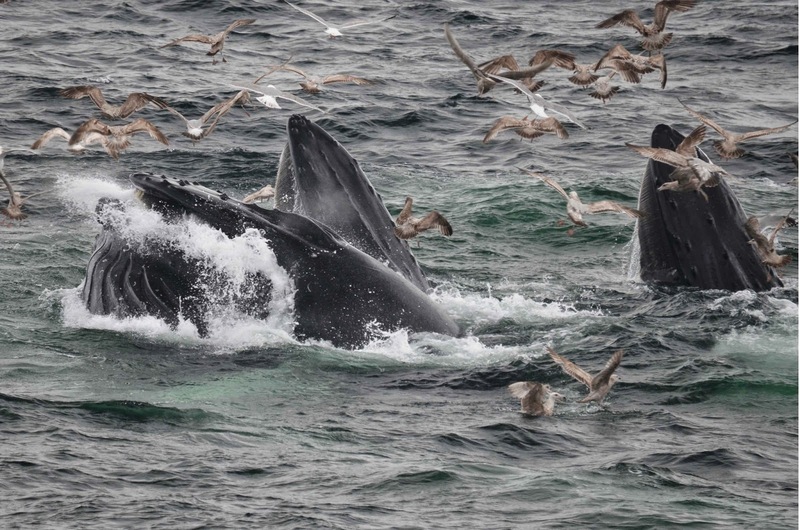 The commotion created by the feeding humpbacks must have also caught the attention of two large fin whales in the area who steadily cruised alongside us. Approaching the feeding group with the most bird activity, we were not surprised to find Osprey and Pleats who have been two of our many regulars over the past few weeks. 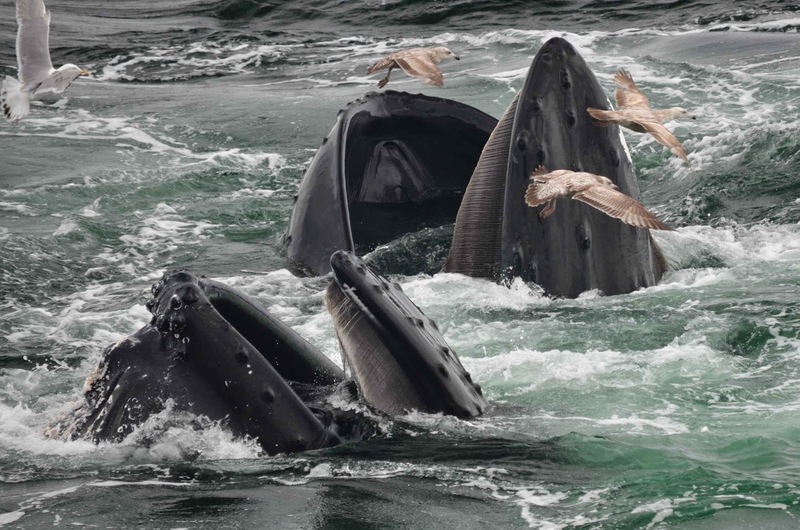 The third whale, however was a mystery to us. We later IDed the whale as Eraser! While the trio was pretty calm upon our arrival, things heat up very quickly! 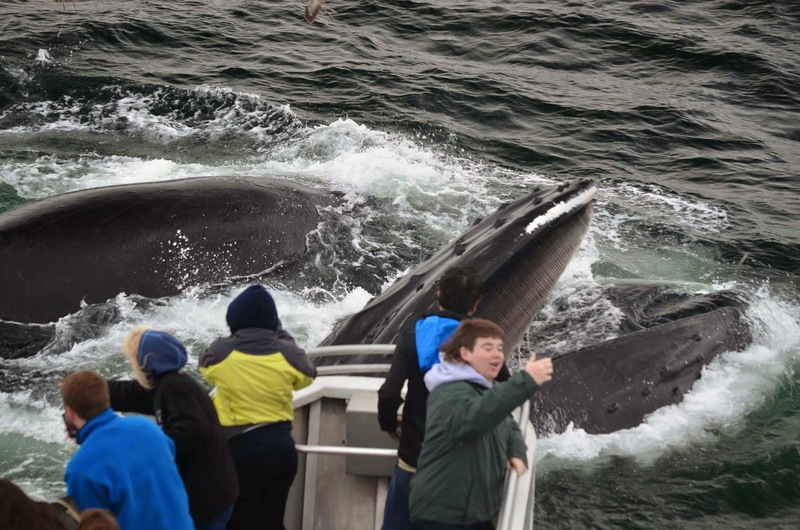 These whales began repeatedly lunging out of the water directly next to the boat. Sand lance flew from their mouths as they lunged through the school of fish (see photo). I got the impression that maybe the sand lance were actually trying to hide beneath the Asteria for shelter based on how close the bubble clouds were to the boat (see photo). Eventually, a nearby trio joined powers with our trio and began creating enormous bubble nets! Again, two of them were regulars (Samara and Aswan), but one I did not recognize. 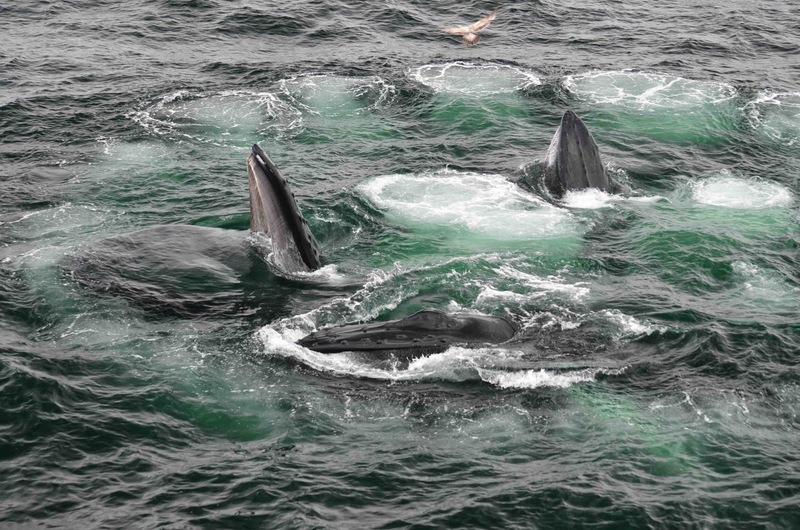 I found it very interesting that these were all single whales. We have seen many mothers with their calves just about every day but, today they were nowhere to be seen. Hopefully, they were in one of the nearby groups so we will continue to see them in the coming days. After looking very closely at my photos while trying to ID the two unknowns, I noticed that one of them had a recent entanglement injury on its peduncle. 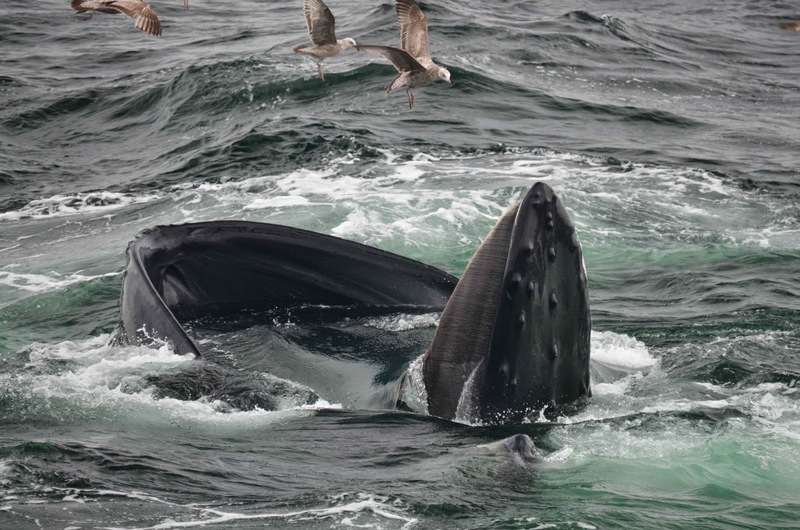 Whales will often become wrapped and entangled in fixed fishing gear such as lobster pots and gill nets. The freshness of the wound indicates that the entanglement most likely occurred within the past few days or so. Sometimes they can free themselves of the entanglements but, other times entanglements inhibit them from feeding freely. The deep gauges can also cause infection which may lead to death. It’s great to see that Weathervane, this second unknown, was triumphant in freeing itself. 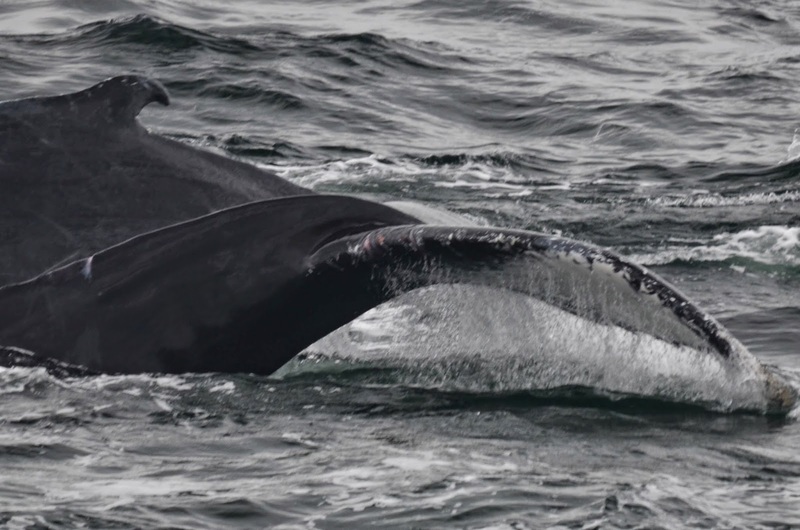 This scar will become evidence of one of possibly many entanglements this whale will encounter throughout its life. At one point during today's feeding frenzy, a young man on the port pulpit even got a selfie with Osprey!